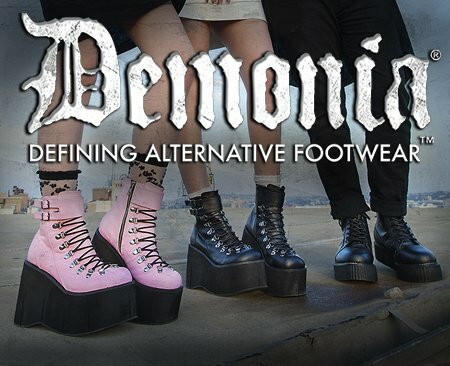 Alternative, defiant, and nonconforming enthusiasts need look no further than DEMONIA for the most cutting-edge, beyond-the-ordinary line of footwear. Its original meaning and connotation of demonic diva is by no means gender exclusive. DEMONIA's no-nonsense, take-no-prisoners attitude is equally desirable to both female and male fans of the alternative underground culture. This vast collection of edgy footwear for both sexes caters to a wide variety of subcultures, and is offered in a variety of styles - from sandals, sneakers, and Mary Janes to creepers, Goth, and platform boots. DEMONIA not only reflects the alternative lifestyle, it defines it.